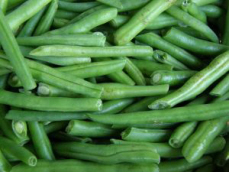 We love green beans here in our home but we often get bored with the same old, same old...green beans recipes. A few weeks ago my sister gave me her recipe for Baked Swiss Green Beans and we immediately fell in love with it. Even my little grand daughter will eat her veggies when I make this recipe during our family meals. This recipe will make 5 to 6 servings. Preheat oven to 350 degrees F. Melt the butter; stir in the flour, salt, ground black pepper, granulated sugar and chopped onion. Slowly stir in the sour cream gradually, stirring constantly. Simmer mixture at low temperature until thickened, stirring occasionally. Fold in the green beans; heat thoroughly. Pour mixture into a buttered 2 quart casserole dish. Sprinkle the shredded Swiss cheese over the top. Combine together the crushed Corn Flakes Cereal with the melted butter and then sprinkle over the top. Place casserole dish into the preheated oven and bake for 20 minutes or until done.